Does anaerobic training damage aerobic fitness? I am now well into the final phase of race-specific preparation for the Robin Hood half marathon in September. I have added two sessions per week of moderately high intensity training, such as intervals or a tempo run, while making a slight reduction in over-all training volume relative to the base-building phase that was dominated by low intensity running. My most recent sub-maximal tests show no improvement in beats/Km over the past month. Perhaps this is a realistic indication that my fitness has peaked – though well below my target level. However there is an alternative explanation. This brings us back to a long-standing debate: does anaerobic training damage aerobic fitness? Aerobic fitness is the capacity to fuel muscle contraction by means of the combustion of fuel – either glucose or fat – in the presence of oxygen, to produce carbon dioxide while transferring chemical energy to create high energy phosphate bonds in molecules of adenosine triphosphate (ATP), which in turn fuels muscle contraction. The key steps of this process of oxidative metabolism occur in mitochondria within muscle cells, especially in slow twitch muscle fibres which are capable of generating a modest power output by repeated contraction over a period of hours, before they become fatigued. The three major physiological adaptations that are required to establish aerobic fitness are increase in mitochondrial oxidative enzymes, increase in the density of capillaries delivering oxygenated blood to the muscle cells, and increased pumping capacity of the heart. As was first clearly demonstrated by Arthur Lydiard , often described as the ‘father of jogging’ but also coach of Olympic champions including Peter Snell, gold medallist at 800m in Rome and at 800m and 1500m in Tokyo, aerobic fitness can be established by a large volume of low intensity running. However it should also be noted that at least some aspects of aerobic fitness, especially the development of mitochondrial oxidative enzymes, can also be enhanced by high intensity interval training, as clearly demonstrated by Martin Gibala and colleagues, at McMaster University in Ontario. Anaerobc fitness is the capacity to fuel muscle contraction by metabolic processes that do not require oxygen. There are two major anaerobic processes: glycolysis, which generates ATP from glucose in a manner that extracts only a small fraction of the energy available in glucose, by converting it to lactic acid; and the phosphocreatine system which employs the chemical energy contained in high energy phosphate bonds of phosphocreatine to generate ATP. The phosphocreatine system can release energy very rapidly but the total capacity of the system is small, typically fuelling intense muscle contraction for a period of less than 10 seconds. Therefore this energy source is mainly of relevance to sprinting, and plays an almost negligible part in distance running. However, the production of lactate from glucose via glycolysis plays a crucial, but ill-understood role, in distance running. The term anaerobic capacity is used by different people in different ways. Simon Green from University of Western Sydney wrote an interesting article discussing the various ways the term has been used, and the confusion that has arisen from this. In a paper written in collaboration with his former mentor, Professor Brian Dawson from University of Western Australia, Green offered the following definition: Anaerobic capacity is defined as the maximal amount of adenosine triphosphate resynthesized via anaerobic metabolism (by the whole organism) during a specific mode of short-duration maximal exercise. I think that is a helpful definition though in my view it undervalues the important role of anaerobic metabolism in setting the limits on performance during events ranging from 800m to marathon. At least for the distance runner, the capacity to sustain a minor contribution from anaerobic metabolism over a time scale of order of an hour or two, is important. While the aerobic capacity produced by a large volume of low intensity running might be enough to transform a typical couch potato unable to run continuously for 5K into a 3 hour marathoner, I think it is likely that the ability to squeeze extra power from anaerobic metabolism makes a significant contribution to the difference between a 2:10 marathoner and a 2:05 marathoner, and indeed allows recreational athletes to perform at their best possible level across any distance from 800m to marathon. One major mechanism is via hypertrophy of type 2 (fast twitch fibres) which are specialised for anaerobic metabolism But other processes are important. These include the ability to remove lactic acid, since the factor that limits anaerobic energy production is the accumulation of acidity. (Lactic acid is a combination of lactate ions and hydrogen ions. The hydrogen ions make it an acid.) When acid levels in muscle become too high, muscle contraction ceases. Removal of lactic acid is achieved by the Cori cycle, which regenerates glucose from lactate in the liver. Furthermore, muscle, heart and even brain, can metabolise lactate directly to produce energy via conversion back to pyruvate which is an intermediate molecule on the pathway to the oxidative metabolism of glucose. In the presence of oxygen, pyruvate undergoes oxidative metabolism in mitochondria generating ATP and fuelling intracelluar processes including muscle contraction. A third mechanism by which anaerobic metabolism can be enhanced is by increasing the ability to tolerate acidosis. This mechanism might operate via either an increased capacity of muscle to buffer acidity or an increase in tolerance of acidity mediated by the brain. Maybe this latter mechanism could simply be regarded as an increase in mental toughness produced by anaerobic training, though I believe that the mechanism by which the brain regulates tolerance should not be dismissed merely as mental toughness. I believe that the regulation of tolerance plays a cardinal role in the over-training syndrome. But that is an issue I will defer to my next post. In general, any form of exercise that involves rapid consumption of a large amount of energy will enhance anaerobic capacity. For example explosive activities such as sprinting will promote the development of type 2 fibres. In addition, activities that entail sustained exposure to moderate levels of lactate, such as intervals with short recovery or tempo running, would be expected to increase the body’s capacity to utilise and thereby dissipate the accumulated lactate. Because anaerobic metabolism provides a rapidly accessible but transient supply of energy, whereas aerobic metabolism provides a slow but sustainable supply, the proportion of total energy provided by anaerobic metabolism decreases with duration of activity. For intense activity lasting about 90 seconds, the amount of energy provided by anaerobic metabolism is approximately equal to that provided by aerobic metabolism, but for longer events, aerobic metabolism is the dominant source. However, for races over distances from 5km to marathon the pace is not far from lactate threshold – the level where lactate begins to accumulate remorselessly if exercise is sustained. A 5K race is run a little above lactate threshold because modest accumulation of lactate can be tolerated for 15-20 minutes. In contrast, a marathon is run a little below lactate threshold, but nonetheless in a zone where lactate level is appreciably above resting level, though relatively stable because the rate of dissipation matches the rate of production. Thus even in the marathon, a small portion of power is derived from anaerobic metabolism but perhaps even more importantly, the limit on marathon pace is determined by the ability to dissipate acidity. Enhancement of this ability is crucial for maximal marathon performance. What is the effect on anaerobic training on fitness for distance racing? The black line in figure 1 is a schematic represention of the way in which lactate level might increases as pace increases, at the beginning of a training block. As pace increases beyond a vaguely defined threshold known as the aerobic threshold, lactate level rises slightly, typically exceeding 2 mMol, but then remains nearly constant as pace increases up to the point where lactate begins to rise sharply – the lactate threshold. Between the aerobic threshold and lactate threshold, a modest amount of anaerobic metabolism generates lactic acid but the level remains failry stable because the body is able to dissipate the lactic acid as fast as it is produced. A crucial feature relevant to anaerobic metabolism during distance running is the fact that there is no sharply defined anaerobic threshold. Anaerobic metabolism contributes a small but steadily increasing amount to total energy production as pace increases across the entire range. As the runner approaches the lactate threshold, the upward trend of lactate level increases. When the rate of production overwhelms the ability to dissipate the lactic acid, the concentration of lactate exhbits a marked upswing. The green line represents the increase in lactate after a block of low intensity, high volume training (i.e. typcial aerobic training). Mitochondrial enzymes and the density of capillaries around slow twitch fibres have increased, favouring aerobic metabolism. The decreased proportion of energy derived from anaerobic metabolism leads to a slower rise in lactate, so the lactate threshold occurs at a higher pace. It would be expected that marathon performance would be improved because the runner could maintain a faster pace without remorseless accumulation of acidity. Furthermore, since running at low intensity favours the metabolism of fat relative to glucose, this training would be expected to increase capacity to metabolise fat and hence, during the marathon, glucose would be conserved. However, it should be noted that an athlete who has already enaged in extensive base-building prior to the beginning of the training block, there will be little scope for futher aerobic development and the rightward shift of the curve is likley to be curtailed. Green: low intensity high volume training shifts the curve rightwards, increasing marathon pace. However if there is near full aerobic development at baseline, the increase will be trivial. Red: sprints with full recovery produce hypertrophy of type 2 fibres, shifting the curve to the left thereby decreasing marathon pace though middle distance performance might be increased. Blue: intervals and tempo sessions lead to hypertrophy of type 2 fibres, increasing lactate at mid-aerobic paces, and also increase aerobic capacity, producing modest increase in marathon pace. 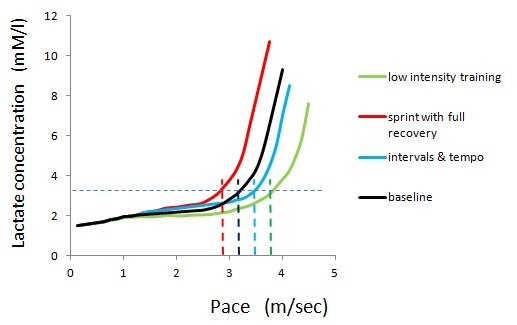 The red line represents the changes in lactate after a block of training consisting mainly of short, explosive bursts of activity separated by full recovery – typical of sprint training. From the point of view of energy production and utilization, the most important change will be hypertrophy of type 2b (anaerobic fast twitch) fibres. As these fibres have very limited capacity for aerobic metabolism, anaerobic metabolism will have increased relative to aerobic metabolism and the lactate threshold will be reached at a slower pace. On the other hand, it is probable that the peak attainable level of lactate will have increased. Because at least moderate elevation of lactate can be tolerated for periods of up to 15 minutes or so, it is quite likely that performance over middle distance events will have been enhanced by this block of training, but marathon performance is likely to have deteriorated. In this sense it might be claimed that the training block has impaired aerobic performance, though there had not necessarily been any intrinsic damage of the aerobic capacity itself. Provided any conversion of slow twitch fibres to fast twitch fibres is negligible, the ability of muscle to metabolise fuel aerobically has not suffered sustained damage. In summary the athlete is likely to have enhanced fitness for middle distance events but impaired marathon performance. What happens if the training block was focussed on tempo training or interval training during which effort epochs are separated by short recovery periods. The likely effect is depicted by the blue line. Some development of fast twitch fibres will occur. These will be mainly aerobic fast twitch fibres (type 2a) which are capable of aerobic metabolism but derive a smaller proportion of energy form aerobic metabolism than slow twitch fibres. Hence, production of lactate will be higher in the zone between aerobic threshold and the lactate threshold, than at the start of the block (black line.) However, due to the sustained levels of lactate throughout the tempo sessions and interval sessions, capacity to handle lactate will be enhanced. So the sharp upward turn of lactate level will be deferred to a faster pace. The athlete is likely to be fitter for both middle distance and long distance racing, even up to marathon distance, than at the beginning of the training block. However, he/she is unlikely to be as fit for a marathon as a runner who engaged in effective low intensity, high volume training, represented by the green line. Does this mean that a marathon runner would be best advised to devote their training time to running at low intensity for as high a volume as time permits? For a novice runner, preparing for their first marathon, I think that is the correct conclusion, though it should be noted that even high volume low intensity training can lead to over-training, as I will discuss in my next post, so there are limits on the optimum volume. However, for an experienced runner with a history of several years of regular training, the situation is different. At the beginning of the pre-marathon training block, an experienced runner is likely to already have well developed capillary density around the slow twitch muscle fibres and mitochondrial oxidative enzymes. Thus, the scope for the type of change depicted by the rightward shift from the black line to the green line in figure 1 is curtailed, and it is likely that a training strategy that includes a substantial amount of interval and/or tempo training is preferable, leading to an increase in type 2 fibres and also a small rightward shift of the lactate curve, thereby maximising race pace. How does this analysis match the recommendations of expert coaches? Let us consider in turn the training strategies recommeded by six different coaching schools, ordered according to proportion of high intensity training. Phil Maffetone recommends that the majority of training s done at easy paces where ‘easy’ is defined as slower than the pace required to produce the heart rate which he calls the Maximum Aerobic Function (MAF) heart rate. MAF heart rate is defined as (180 – age) modified by some quasi-arbitrary adjustments allowing for experience and age. At least for the novice non-elderly runner, the MAF heart rate is likely to be comfortably below lactate threshold. The analysis depicted in figure 1 suggests that Maffetone training is ideal for the novice. For a more experienced athlete, the MAF heart rate is increased by 5 beats, and for an experienced elderly athlete, it is in fact increased by total of 15 beats per minute. If I were to ignore a subtraction on account of my recent bout of arthritis, my MAF heart rate would be in a zone where I would expect to be generating appreciable lactic acid, so even training at the MAF heart rate is likley to produce some anaerobic development. The late John ‘Hadd’ Walsh recommended a high volume of low intensity running at or below 75% of maximum heart rate, where lactate accumulation is slight, and in addition, one or two sub-lactate threshold runs of approximately an hour duration each week, during base-building. The pace of the sub-lactate threshold runs is the maximum pace at which a steady heart rate can be maintained for an hour. Such sessions would be expected to produce substantial enhancement of capacity to handle lactate, and hence, increase anaerobic capacity. Furthermore Hadd recommended a period of race specific training after base-building in which moderately intense session were introduced. Thus Hadd training is likely to be suitable for a moderately experienced athlete. Nonetheless, I consider that an experienced athlete is unlikely to achieve their absolutely peak performance unless the base-building is followed by race-specific training that is sufficiently intense to develop type 2a fibres. Arthur Lydiard’s base-building program was similar to that recommended Hadd, and indeed probably provided the foundation on which Hadd subsequently constructed his base-building program. Lydiard recommended a large volume of low intensity training, but prescribed sessions at one of three different effort levels. A ‘quarter effort’ is a session that could easily be repeated again immediately. A half-effort session could be repeated the next day while a three-quarter effort sessions requires at least a full day of recovery. It is not certain how Lydiard’s three quarter effort session compares with Hadd’s sub-lactate threshold session, but from the available descriptions of the Waitakere hill run that Lydiard’s athletes performed on Sunday morning, I suspect that for Lydiard’s elite athletes the three quarter effort session was more demanding than Hadd’s sub-lactate threshold session. Lydiard’s stable of Olympic medal winners, over distances from 800m to marathon, demonstrates that his program was capable of producing world-beating performances, at least in the middle years of the last century. Pfitzinger and Douglas offer a range of marathon training plans, differing in weekly mileage but based on similar underlying physiological principles. Their 18 week 50-70 mpw plan assumes that the athlete has already done a substantial amount of base-building. The plan itself is divided into four mesocycles. The first mesocycle is focussed on building endurance by means of increasing total miles per week and increasing long run distance, mostly at a modest pace. The second mesocycle places the emphasis on developing capacity to handle lactate, by adding a fairly demanding weekly lactate threshold session. The third mesocycle prepares for running at marathon pace, while also including some faster sessions that are likely to promote the development of type 2a fibres. The fourth is a three week taper. This program is for experienced runners, and provides a fairly demanding combination of high volume at moderate intensity, lactate threshold development, and a modest amount of faster running. The program developed by the Furman Institute entails only three running sessions per week: an intense interval session, a tempo session and a long run at a demanding pace. In addition, the athlete is encouraged to do a substantial amount of cross training. The Furman Institute has demonstrated that their program can lead to impressive performances, even by relatively inexperienced athletes. I think that this program is perhaps the most efficient way to produce the shift from the black line to the blue in figure 1. However to my taste, it is a rather brutal program. Furthermore, adequate cross training to augment aerobic conditioning is crucial. The most successful distance coach of the modern era is Renato Canova, who coaches several of the leading Kenyan half marathon and marathoners. He places much less emphasis on low intensity running and greater emphasis on long tempo runs. The key sessions in his marathon program are long runs at a pace very near to marathon pace. However, Canova’s athletes almost certainly commence their training with well developed capillaries and mitochondrial enzymes, based on years of running to and from school in many instances. The key lesson to be gleaned for figure 1 and supported by a brief review of the training programs recommended by experienced coaches is that the optimum training for an individual depends not only on the target race, but also on experience and fitness at the start of the training block. At present, I am preparing for a half-marathon, which therefore tips the balance a little towards higher intensity sessions compared with marathon training. But, I started this current training block with a less well developed aerobic system than I would have wished. So it remains unclear whether or not I have been wise to move from a predominantly low intensity program to a program including tempo runs, intervals and progressive long runs. However if my ability to handle lactate is improving, I might nonetheless be nearer to optimum race-fitness despite not yet having achieved maximal aerobic development. I am aware it is a gamble, but I think that if I am to achieve the best half marathon of which I am capable this year, this is the preferred strategy. Ewen jokingly claims to have found a bookie who is prepared to offer odds of a mansion in Forrest (the poshest suburb of Canberra) against Ewen’s garden shed on the outcome of my attempt to better my M60 HM best, achieved 6 years ago. I think these odds are not unreasonable. I have advised Ewen to make sure he removes his lawn-mower from the garden shed in advance, but I will certainly do my best to secure a mansion for him in Forrest , near to his favourite training runs around Lake Burley Griffin and not too far from Mount Ainslie. You are currently browsing the Canute's Efficient Running Site blog archives for August, 2013.